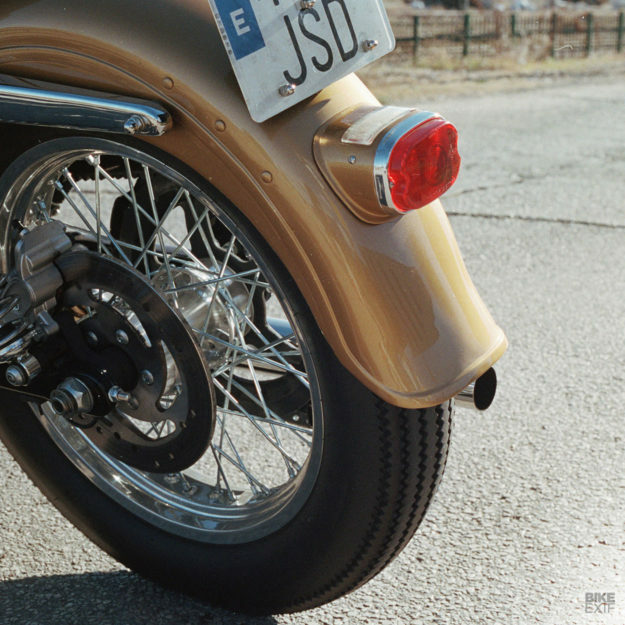 Last year, the Harley-Davidson Sportster turned 60. 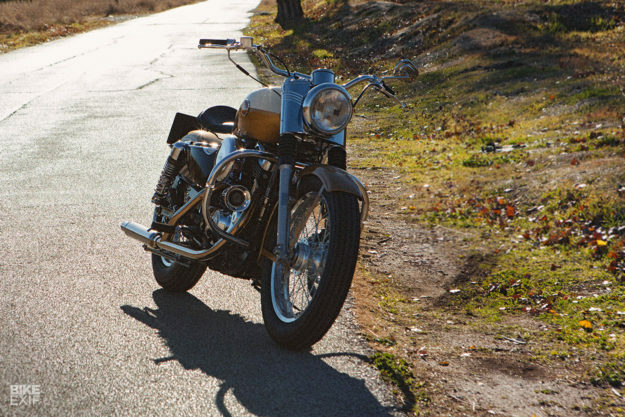 It’s an extraordinary milestone, with only the Royal Enfield Bullet having a longer unbroken model run. Surprisingly, Harley didn’t make much noise about the Sportster’s 60th birthday. But the Spanish builder Efraón Triana decided to celebrate it in a most unusual fashion. 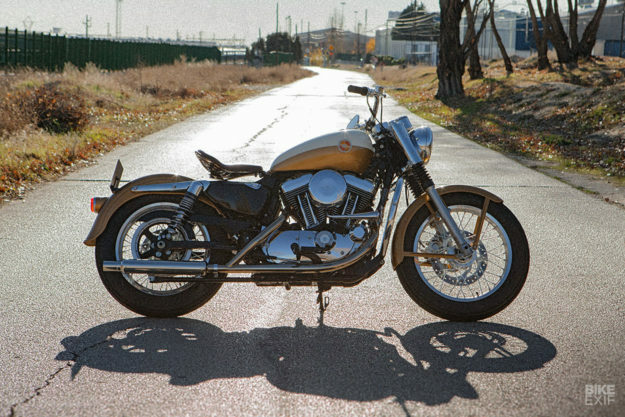 With the blessing and support of Harley-Davidson España, he’s taken a 2016 model Sportster and reconfigured it to resemble a late 50s Ironhead (below). 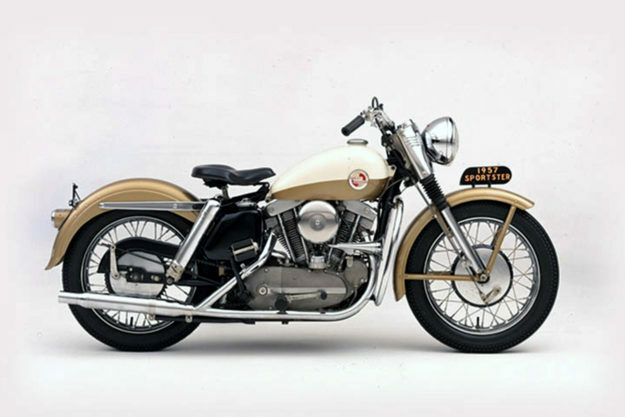 Not an easy task, but Efraón had one factor in his favor: development of the Sportster has always been incremental. Like Porsche, Milwaukee prefers evolution to revolution. 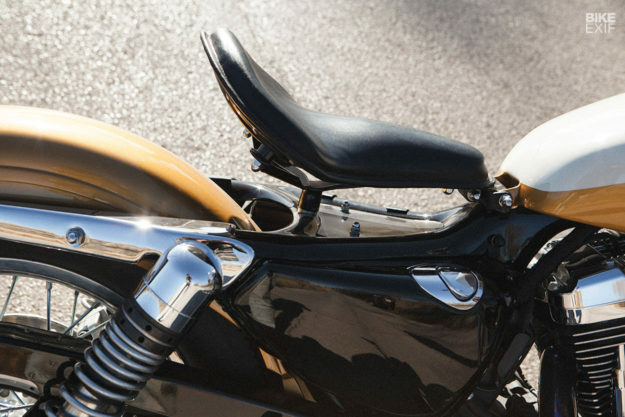 Just as you can see the link between a 911 built in 1963 and one in the showroom today, there’s a clear lineage between a 1957 Sportster and the current model. 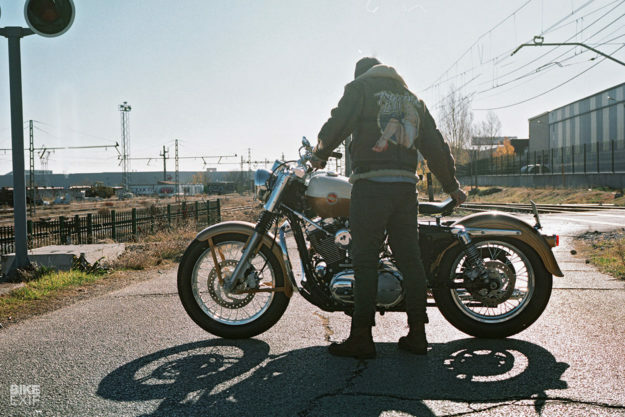 Efraón’s idea was to build a Sportster with all the charm of a 1950s model, but the reliability and functionality of a modern bike. 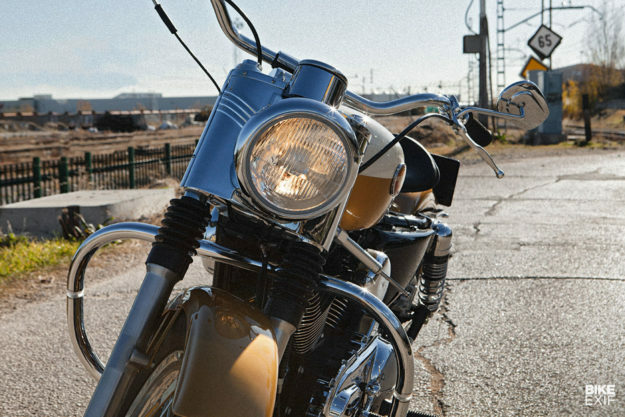 Because, as we all know, classic bikes are great—until you find yourself spending more time with your hands in the toolbox than on the grips. Efraón had the skills to make this happen. He’s best known for his involvement in Cafe Racer Dreams, the Madrid shop that was setting the pace in the custom scene a few years ago. CRD has since changed hands, and Efraón has now returned to his original solo workspace, UFO Garage. The donor bike is a XL1200, and the brakes and suspension are untouched. They might not be as good as a Brembo and Öhlins setup, but they’re a helluva lot better than the drum brakes and spindly telescopics fitted to the Ironhead Sportster. 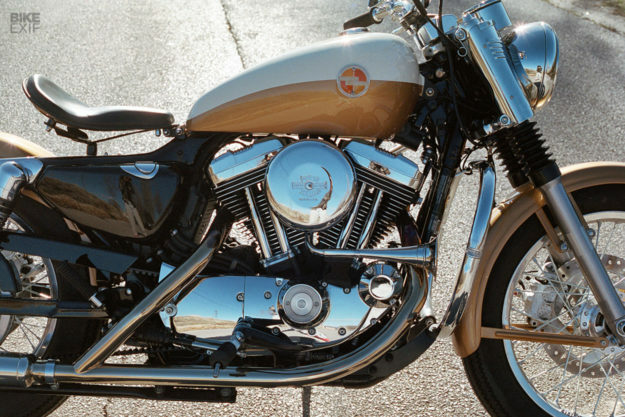 The bars are handmade to evoke the shape of the originals, and the modern-day Sportster speedo has been modified and relocated to match the classic vibe. Leading the way is a Hella headlamp, flushed into a first-generation housing. The exhaust system was custom made by the [details] specialist GR, and follows the lines of the 1957 original admirably. 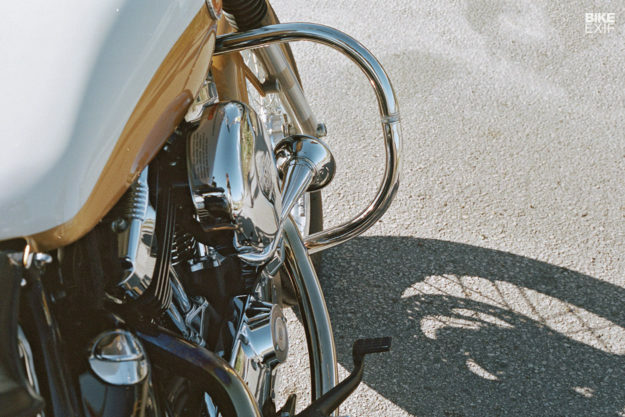 But the air filter cover, however, is a vintage Sportster item, modified to fit the current fuel injected Evolution engine. Right above is an original 1957 Sportster tank, subtly tweaked to fit the modern frame and plumbing that Milwaukee introduced in 2004. The tank badges appear entirely original too, but Efraón had to hand-make these. He also made a new carbon fiber base so that the 1957 tractor-style seat and support would fit the new frame. 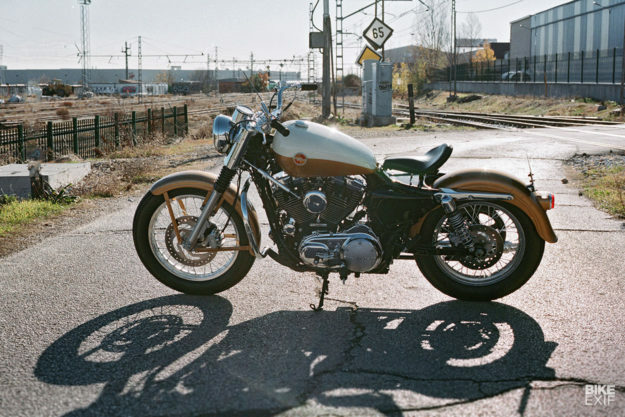 If this Sportster whipped past you on the road, you’d be hard pressed to tell it’s a modern machine. It’s a very clever ilusión óptica. Maybe Harley-Davidson should look at producing a similar machine themselves, since 2018 is the 115th anniversary of the Motor Company?